We all have those days - when we are feeling sluggish and not really fully prepared to get out of our pjs and into socially acceptable attire. Especially as it gets a little (a lot) colder now, it is even easier to layer up in whatever is easiest in the name of keeping warm. But what about those days where we want to put on our boss babe hat? Or in this case - blazer. 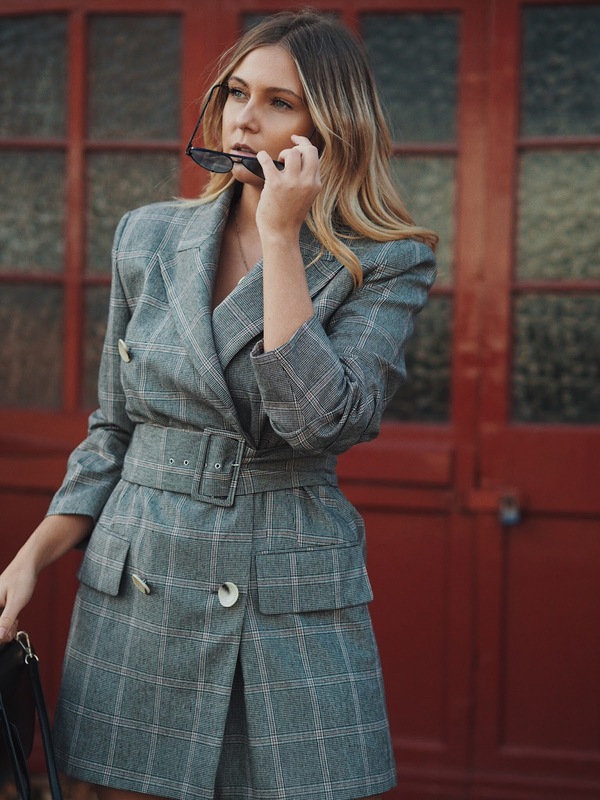 I have always been a firm believer in dressing for the occasion, and when I look back on certain experiences; interviews, school discos, day trips - I have always spent a lot of time planning my outfit and channelling my attitude through it in the process. I wouldn't ever say that you have to rely on your wardrobe to give you the confidence you need - but in my case, it certainly plays a big part. Something definitely screams business about a blazer and I have obsessed over them for many years now. I have two staple blazers, one black and one white that are always my fail safe for a smart day/evening event. That is probably why I always feel like I am ready to tackle whatever life throws at me when I'm wearing one, which is why I instantly fell in love with this feminine take on the blazer-dress - and probably why I am leaning more towards it at the moment. As I say a lot in my posts, I am a sucker for black, so I was in quite a predicament when I found out this dress came in this check...but also a black. I completely stepped outside of my comfort zone with this but gee am I happy I did. It gave me even more sass than I think it would've in black. Mission accomplished. Another thing I love about a classic boss-babe blazer look (aside from the confidence boost) is the sheer versatility - depending on what level you want to hit. Sure, this is a dress that is achieving everything it is set out to, without being too short so that you can actually wear heels without showing everyone, well, everything. The fact is I can wear this in SO many ways; chuck a polo neck on underneath for that extra warmth and autumnal vibe, wear open with a plain white tee and some jeans, or maybe just a black bodysuit tucked into a PU skirt. I really do think this single blazer could transition you to multiple levels of girl-boss, for whatever the occasion. This post got me thinking about when my love for the blazer actually started - and the fact that I really can't see them ever not being the perfect wardrobe staple. I remember seeing Angelina Jolie turn up to an awards do with Brad Pitt (I didn't personally see her - I mean online, obv) and she was wearing a full suit. I remember feeling in awe at the fact that she effing owned that red carpet...and thats definitely how I want to approach certain moments in my life (maybe not quite red carpet ones - but a red door will do!). So guys...what is your go-to for power dressing and boosting your boss-babe attitude?